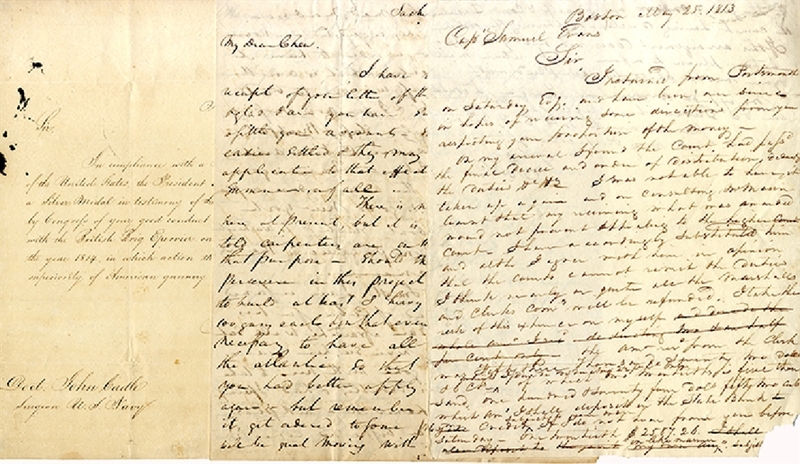 Group of three War of 1812 letters, includes: Autograph Letter Signed “Guran Harris” 3pp. quarto, December 23, 1814, Sacketts Harbor, with integral address to Thomas Chew of the U.S. Navy at Washington, in part: “....it will be necessary to build at least 3 heavy ships from 74 to 100 guns each...Capt Smith I am afraid has gone to the Island of Cuba for his health...The marine officers have not yet been able to settle, no money, I will make Roger Jones pay me the 80 dollars he owes you...” Fine condition...; plus, Autograph Letter Signed by Thomas Chew purser, 2pp. quarto, Boston, May 25, 1813, addressed to Captain Samuel Evans, pertaining to a court settlement. Fine condition....; plus, Manuscript Letter Signed “Smith Thompson” 1pp. quarto, Navy Department, February 10, 1820, addressed to Doctor John Cadle, Surgeon U.S. Navy, 1pp. quarto, Navy Department, February 10, 1820, and reads “In compliance with a Resolution of the Congress of the United States the President directs me to present to you a Silver Medal in testimony of the high sense entertained by Congress of your good conduct & services in the action with the British Brig Epervier on the 29th day of April in the year 1814, in which action the decisive effect and great superiority of American gunnery were so signally displayed...” Fine conditon. On April 14, 1814, Epervier sailed from Port Royal, Jamaica, calling at Havana, where she took on board $118,000 in specie. She left Havana on 25 April bound for Halifax. The 22-gun sloop-of-war USS Peacock captured Epervier off Cape Canaveral, Florida, on 29 April, during the War of 1812. Epervier's crew consisted mainly of invalids from the hospital, giving her the worst crew of any ship on her station. In the engagement Epervier suffered eight killed and 15 wounded, as well as extensive damage.